South Korea’s bragging point has always been the coexistence of modernity with its traditional culture. There are always quotes from tourists on websites and brochures who marvel at the existence of royal palaces right in the middle of the cosmopolitan city of Seoul, and the continued practice of traditional rituals and customs in a rapidly modernized and globalized society. During my childhood trips to Korea, I never considered the dichotomous relationship of the gasoline-powered cars running past the stone walls of a Joseon dynasty palace. It wasn’t strange; it wasn’t peculiar or unique. It just was. As I grew older and saw more of the world, with my well-traveled eyes, I was actually saddened by how little of history was left in Korea. Compared to the Kyoto palace, the Forbidden City of China, and the great cathedrals of Europe, the palaces of Korea looked shabby, unkempt, and artificial. I mourned the loss of South Korean history and its artifacts to wars, colonialization, and the country’s unchecked desire to have a place among the world’s most modernized, capitalistic countries. However, because of two dramas in the past year, instead of loss, I saw the endurance and survival of history, the miraculousness of time and human development. When I first arrived in Korea, I had the chance to visit and explore the landmark locations featured in 2012’s “Queen In Hyun’s Man” and “Faith”: Gyeongbokgung and Gwanghwamun Square from “QIHM,” and Bongeunsa and COEX from “Faith. Gyeongbokgung, the main palace of the Joseon Dynasty, was the palace that Boong-do first time-traveled from into the future to meet Hee-jin. I have been to that palace many times before, and by the most recent time I went before coming to Korea this year, I was bored of the palace. But thanks to “QIHM,” I have a newfound appreciation of the landmark, as well its history. Built in 1395 and destroyed many times and rebuilt, the structure still stands in the middle of Seoul, a witness to history. 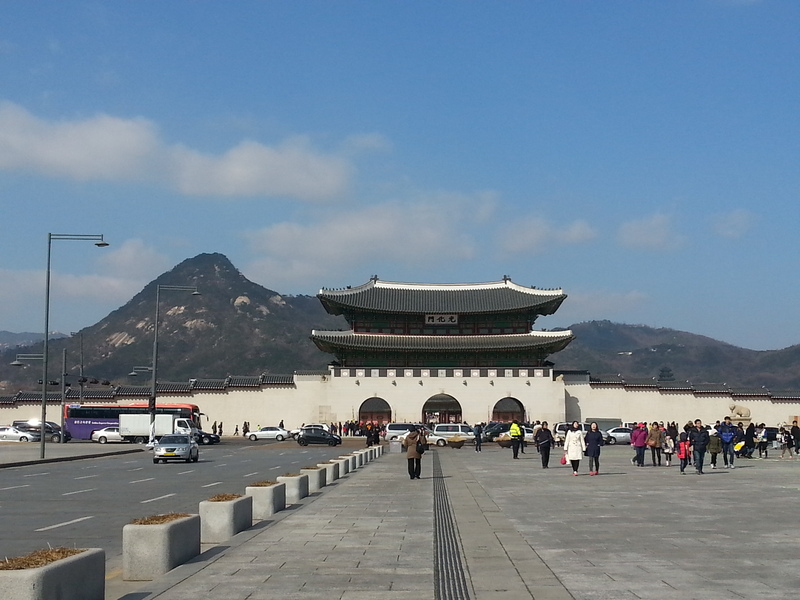 I entered Gyeongbokgung through its main entrance, Gwanghwamun, but instead of walking forward into the main buildings, I turned back and looked toward Gwanghwamun square. 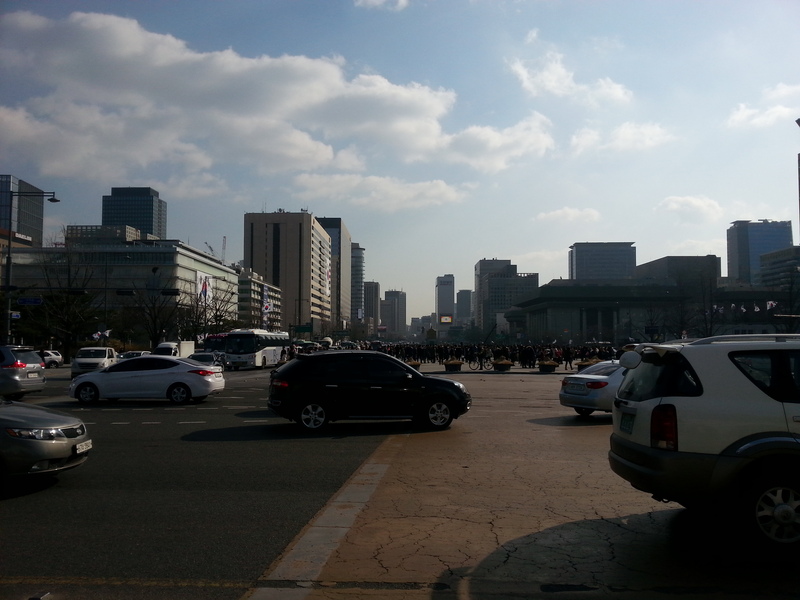 Gwanghwamun Square, walking toward Gyeongbokgung. Inside Gyeongbokgung, look out toward Gwanghwamun. 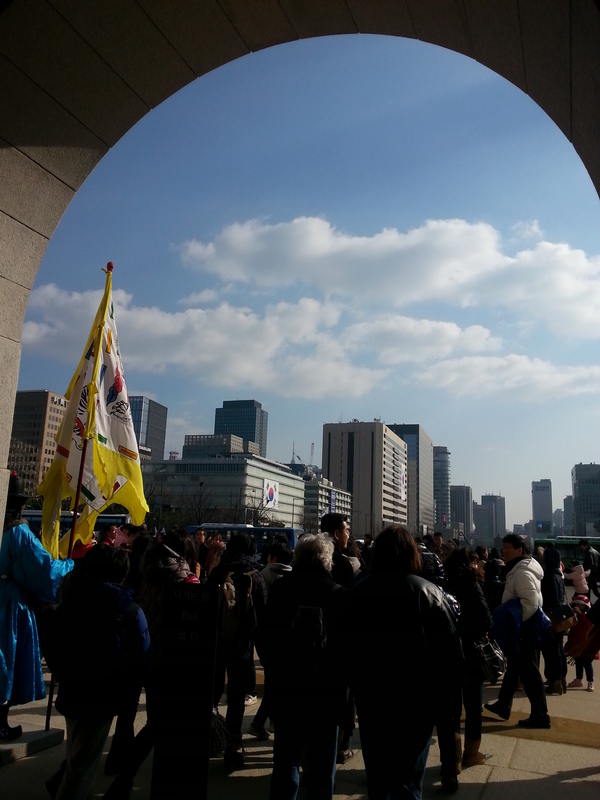 Under the Gwanghwamun archway, looking out at the square. 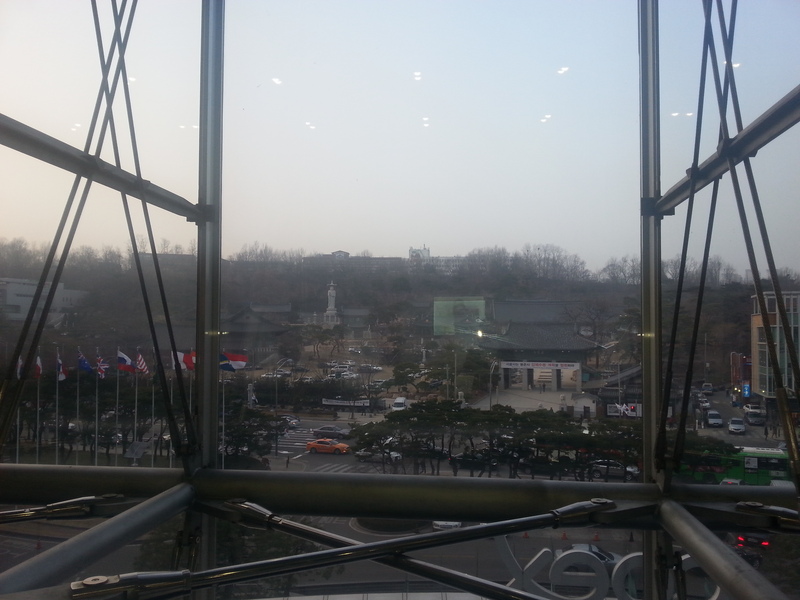 Looking out toward Gwanghwamun square from Gyeongbokgung, right in front of the entrance. 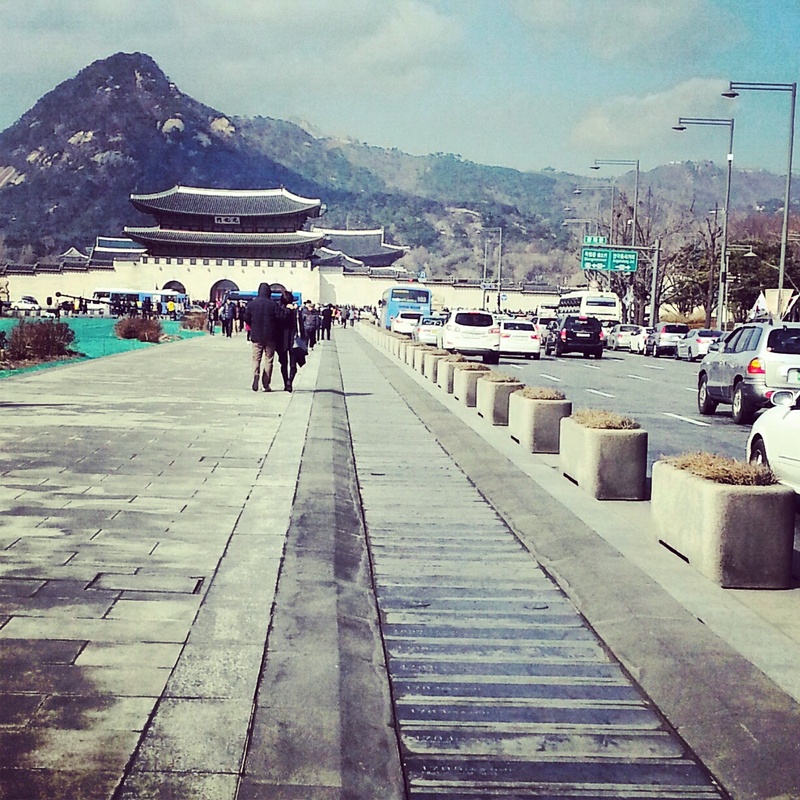 I saw the city of Seoul through Boong-do’s eyes. How strange, how utterly unbelievable! The tall buildings, the cars speeding by! Structures so unlike the ones he was used to, being built out of iron, concrete, and glass. The height! Yet, when he and I look back, the palace is still there, standing as it used to 300 years ago. I walked along the “Memorial Walkway” built in 2009(? 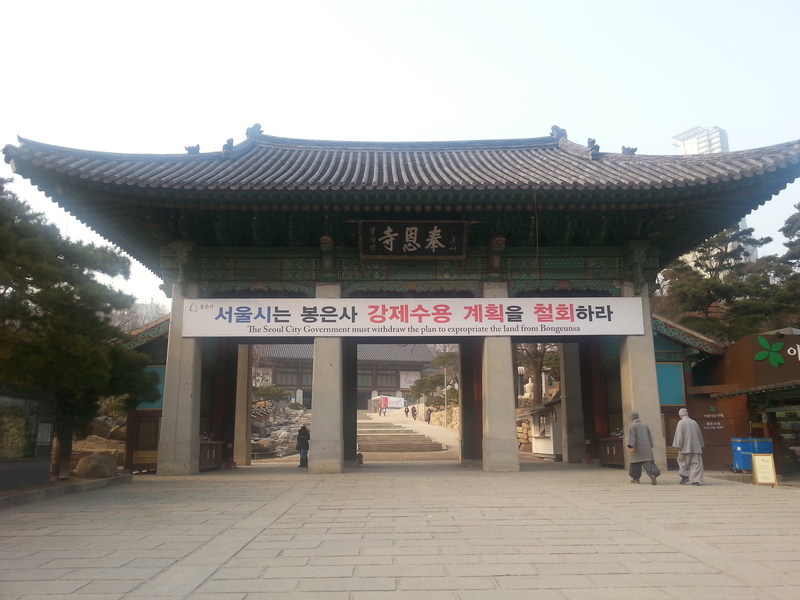 ), to commemorate the history of the Joseon Dynasty. 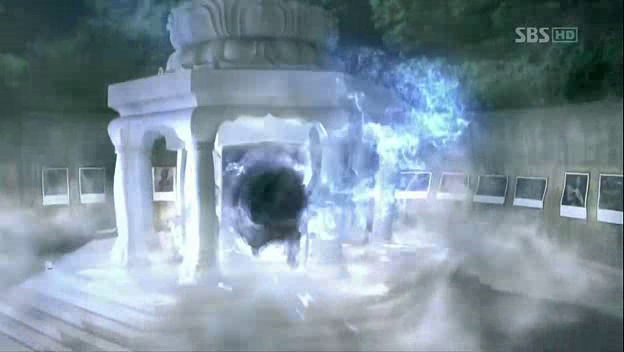 It is the same walkway that Boong-do visited, when he returned to Hee-jin even after the talisman was cut in half. It was where he saw the history of Joseon laid out before him, giving him knowledge of all things to come, making him reflect on a life worth living when you knew all. 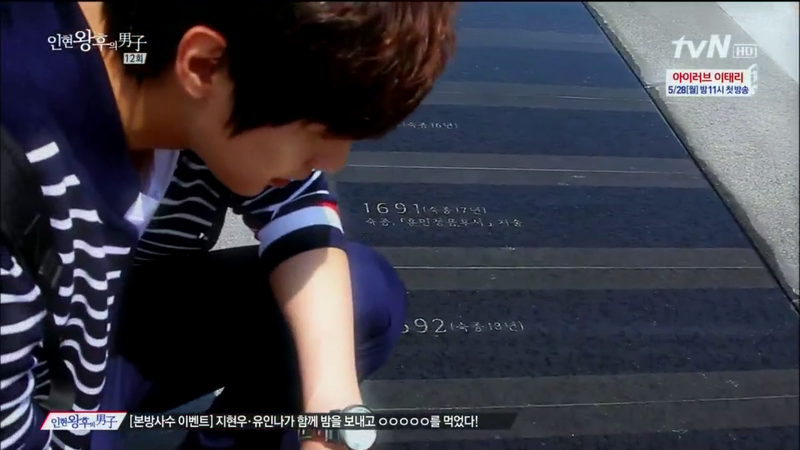 I sought out the time plaque that Boong-do stared at, the stone etched with Queen In Hyun’s return to the palace. 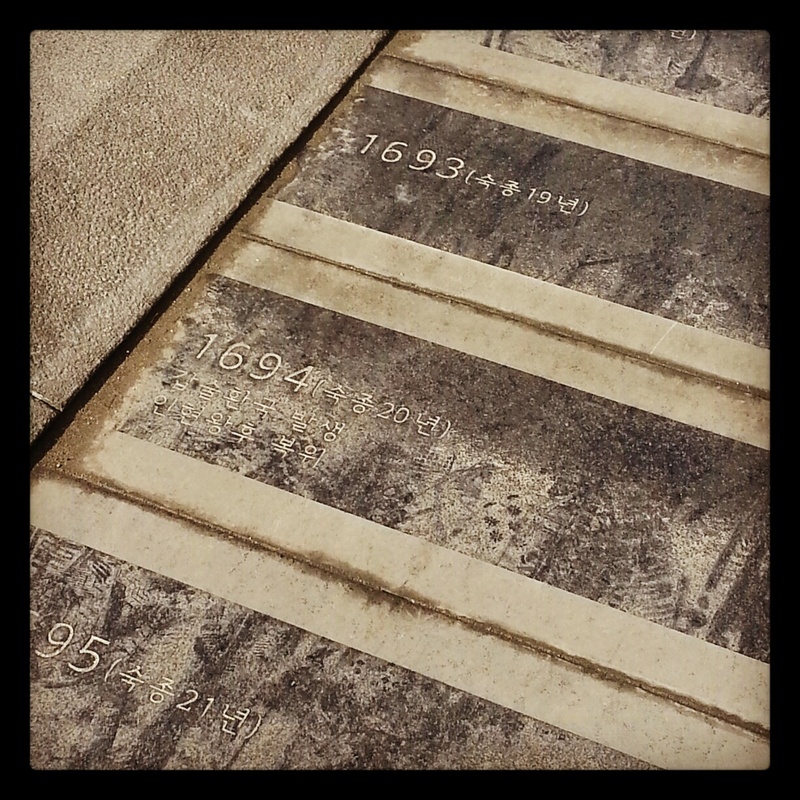 Memorial Walkway at Gwanghwamun square, leading up to Gyeongbokgung. Queen In Hyun is brought back to the palace in 1694. On another day, I visited Bongeunsa and COEX, featured in “Faith.” Bongeunsa is the Buddhist temple where the “heaven’s door” is located, and COEX is the convention hall right in front of Bongeunsa, where Eun-soo had her plastic surgery convention. Entrance to Bongeunsa, pictured from the street looking in. Mireuk Daebul (Great Statue of Maitreya Buddha), where the “heaven’s door” was. The skyline of Gangnam that Young must have seen as he stepped out of the time portal. 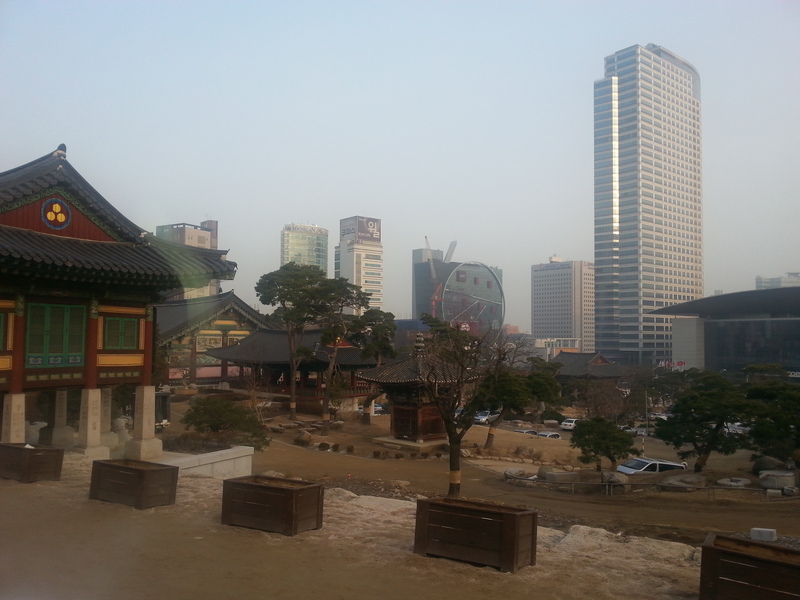 Another view of the Gangnam skyline from inside the temple. 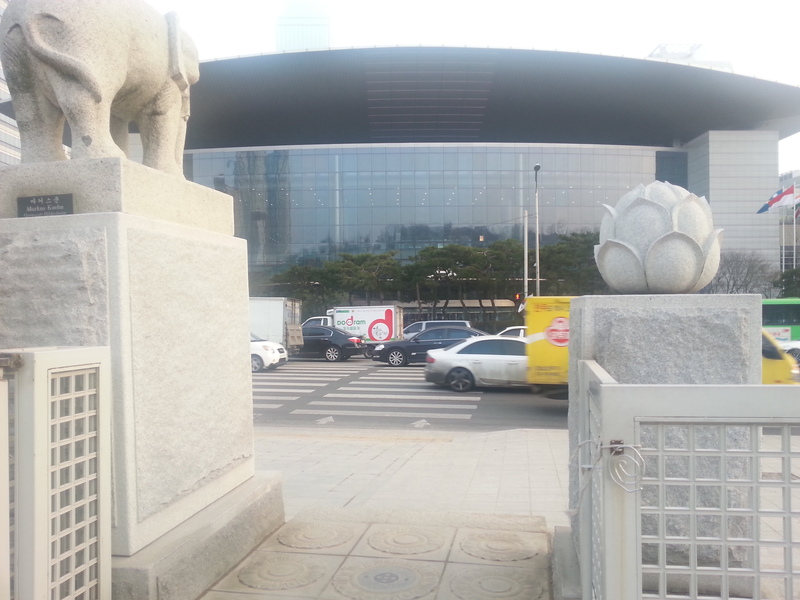 Leaving the temple toward COEX. Exiting Bongeunsa, facing right at COEX. The street Young crossed to get to COEX. 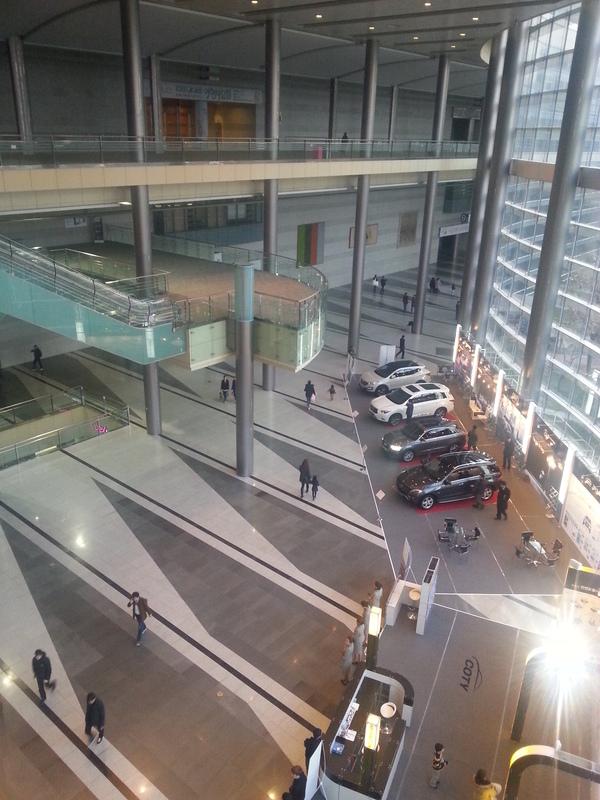 Looking down into the COEX lobby from the second floor. View from inside the second floor of COEX looking at Bongeunsa across the street. 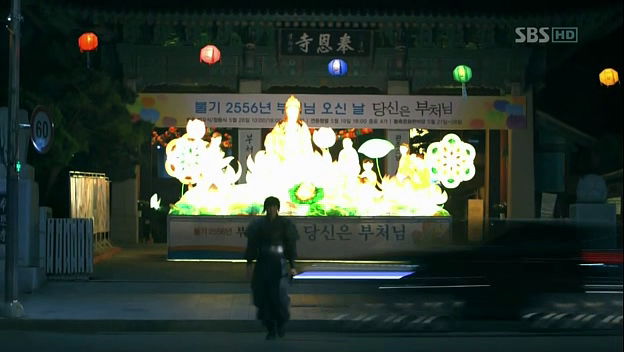 How daunting and strange it must have been for Choi Young, to step out into 2012 from 1351! Walking across seven-hundred years in an instant. The only explanation must have been for him was that he was in heaven; how else can you explain all the night sky almost as bright as the afternoon, the horseless carriages, and structures that tower stories above? While I can’t actually travel through time, I was able to feel the passage of time and the power of history through my walks at the landmarks. It gave me a newfound appreciation of Seoul and how structures hundreds of years old stood next to buildings only a decade old. 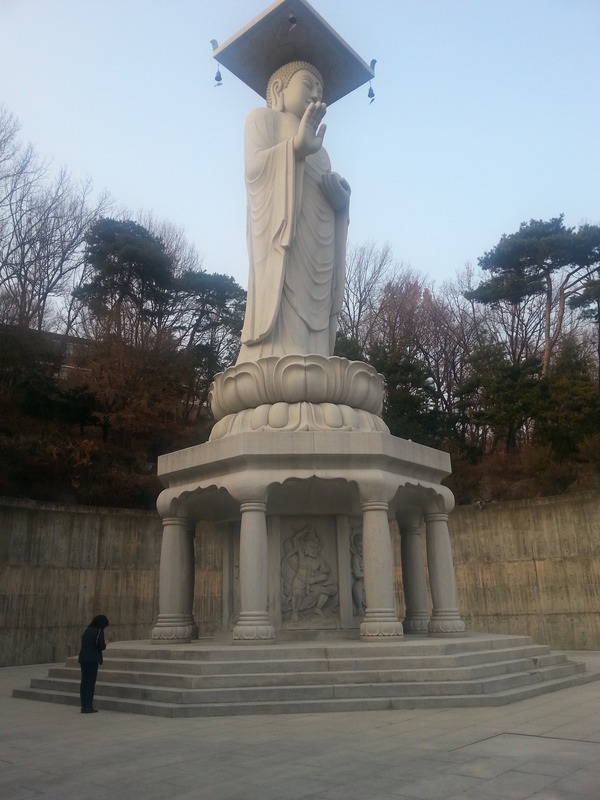 Seoul is not a beautiful city, but it is certainly fascinating. ← Choi Jin Hyuk Giveaway! I wish I could go there too. 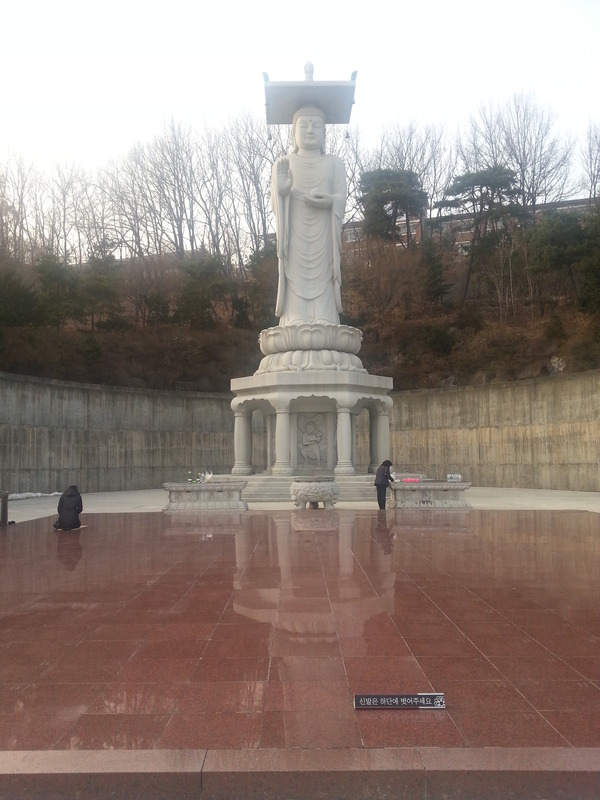 Sorta planning on doing so in some distant future… Really want to see the locations for “Faith” and General Choi’s tomb. On a side note, I’m glad that the Heaven’s door was at the temple ’cause that’s totally makes sense: it’s the closest thing to the stuff in his time. My dear Joonni, it’s nice that you have found contentment in your new surroundings. I look forward to going there in Jan. 2014 w/ Minoz. I’ve been so busy w/all the new movies, I’ve forgotten about living my own life..!!! It’s mid-summer w/ gloomy & monsoon weather in Calif.
I’m so glad that you’ve written this piece, I really love it..”Thank you for sharing”. Que interesante comentario,no solo ocurre allá ,la modernidad se va comiendo al pasado poco a poco, vivimos tan rápido que casi no miramos a nuestro alrededor y solo ante un hecho que nos afecte emocionalmente recordamos y nos damos cuenta recién de los cambios y añoramos. Me encantaría poder viajar a Corea,Seul específicamente y estar en esos lugares que mencionas, que obvio e visto en Doramas y “Faith”, aunque siempre me ha llamado la atención la Cultura Oriental que es antiquísima y diferente a la mía, vivo en Santiago en Chile. Si seria un gusto estar allí y ver yo misma esos lugares ….!!!! Hi Joonni! I was in Seoul early this year and it is really fascinating to see the transition of time reflected in the very urbanized city. But I think what I regret in leaving the city was that I was only able to visit the more popular tourist places that I wasn’t able to squeeze in other spots in downtown Seoul – wasn’t even able to set foot in Gangnam. I would surely try this adventure when I go back. Joonni, thank you so much for your beautiful narrative, and beautiful, magnificent pictures. It is amazing how you put the pictures from the dramas and real life together, SO beautiful. Many, many thanks. Like +1 – Very nice post. 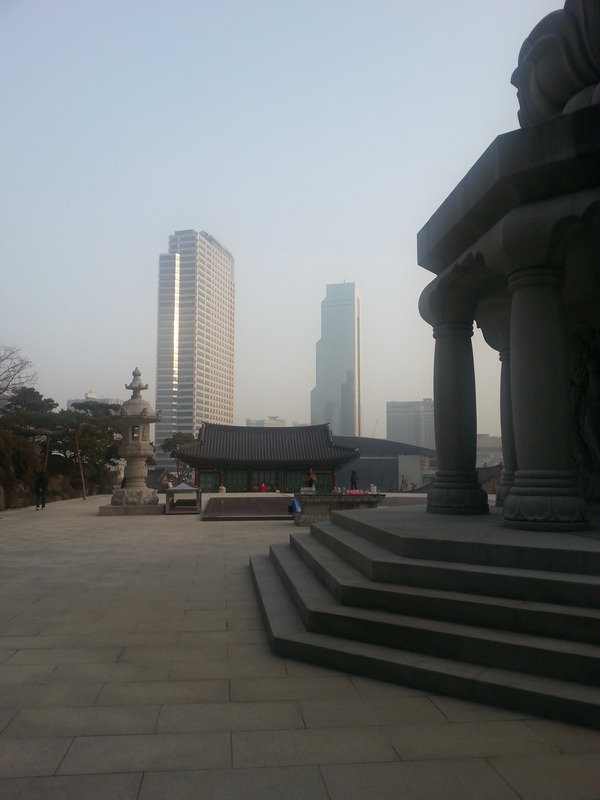 I was there in November last year and walked through Gwanghwahun like you, looking out at modern Seoul from Gyeongbokgung. What a sight it must have been for Kim Boongdo! I also followed Kim Boongdo’s steps as he walked along the Memorial Walk. It was a very significant trip for me, being QIHM’s fan! Is that where you went after we parted on Monday? Glad you went. 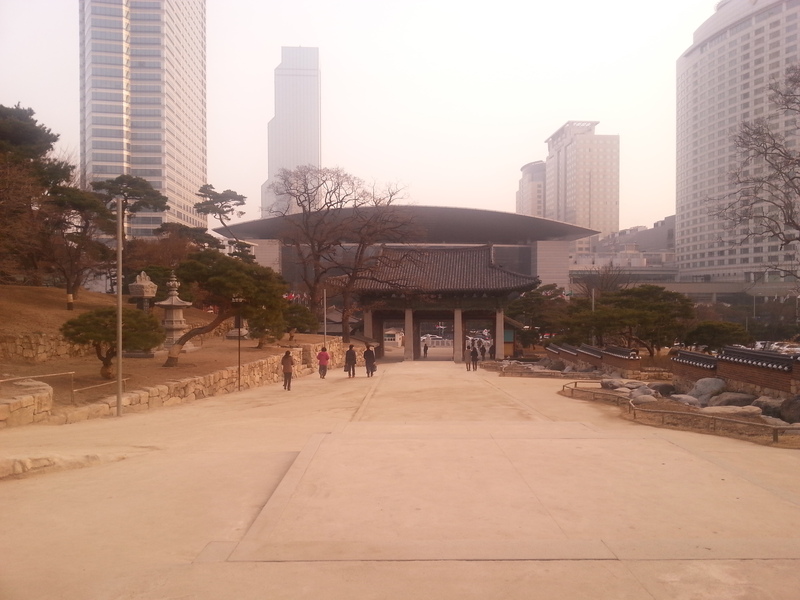 Two of my favourite places in Seoul – Bongeunsa and Gwanghwamun. Wish to thank you for spending time with me in Seoul. Keep well. Thank you for sharing the pictures and thoughts on how the “old” and the “new’ co-exist and how looking at things from a different perspective can bring us greater appreciation. As a fan of Kdramas it’s also nice to see the locations dramas were filmed at. It is my hope/wish to one day travel to South Korea. Keep telling one of my friends that we have to go one day. As always it’s lovely to hear from you. Hope you are well. So Glad to see ur first Post after u shifted to Korea. the pics are really Beautiful. I dont know much abt Korea but thanks to u and ur recaps I am slowly increasing my Hanguel knowledge (sorry if I misspelled or used the wrong word). .
Its Pretty amazing to see that History is coexisting with Modernity. Such existence are increasingly becoming rare as all are in the mad rush of growing modern. . Still in Korea, people do care a lot. .
keep posting more pics like these (ɔˆ ³(ˆ⌣ˆc). .
Having been in Seoul I found the contrast of modern buildings so close to the ancient structures very unique. I wish to get to know more of countryside one day. Love the banner of Imja couple thanks! I have a request to ask all the readers here – you too Joonni- could you answer these questions please for a project my friend is working on? 1- what do you think about Korea in terms of tourism? 3-how would you describe Korea to your foreign friends who have never been to Korea? 4-what is the one word you would associate with Korea? 1) I think Korea is an AMAZING place for tourism, for all the right reasons. Aside from being a Korean drama addict so I see everything as precious in Korea, but realistically, it is a beautiful country, a lot of beautiful cultural traits that fascinate me but clearly clearly economic world power, and the mix of the two, as Joonni so beautifully described, is astounding to me. I love it so much. I love the architecture, I love seeing Korean letters on the buildings, I really like the museums and the parks and beaches.The food is amazing, particularly if you are not vegetarian, the public transportation is the best in the world, and it is totally reasonably priced. I think for me, though, I really really like interacting with Korean people. They have without exception been extremely kind and helpful and willing to go out of their way to make me feel at home. 3) I would say it is one of the most fascinating places I ever visited, and I will keep going back over and over again. It is a place of great harmony and great social change and you can feel, you can see it in architecture, in clothing, in manners. It is absolutely amazing place. It is a MUST to see. This is a really interesting post. Thank u. You awaken again my desire to travel and visit south korea. Definitely, i will include Bongeunsa and COEX in my itinerary. Thanks jooni. Keep it up. Thanks for sharing! I think I’m gonna follow your example & try to visit these same places ESP the Buddhist temple. It looked great in Faith. I will be in Seoul for 8 days this Dec – both work & vacation. So excited to sightsee and eat street food. I have been reading Korean history because of historical dramas I had seen. I was Googling the background of each drama I was seeing. This article was well written and made me want to see Korea and see your culture and how it affected your nation now. Like your article on blending of the “old”and “new” younger generation becomes more appreciative of people’s struggles for freedom, greatness and national identity throughout your history. Have you and Softy seen the official SBS manga of the Faith? I wrote to you via email to give you the link. The manga is beautiful and funny.